It’s a few months late, but here it is, the diary entry for the 28th of October in the Heart Garden. Enjoy! Another lovely sunny gardening day although a bit soggy underfoot – temperatures are still unseasonably warm but at least we’ve had some rain this week as the soil was turning into dust. The wisteria in the front of the studio was looking decidedly crisp due to lack of water – it’s in a pot so we gave it a good drink and mulch – it also needs careful pruning at this time of year to promote flowering buds. 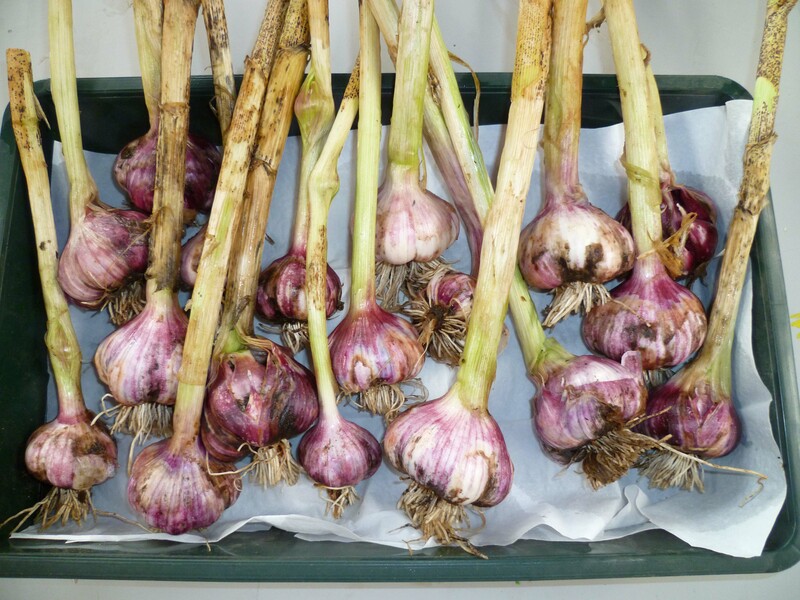 Its garlic planting time again – we like French Thermidour – a pink variety, try to plant garlic from good stock – a garden centre or on-line as these will be virus free and suitable for our climate. Garlic needs a long growing season and a cold spell to make the cloves divide into heads – which is why last winter made such a good crop! Plant in rows 4”(10cm) apart and 1 “(3cm) deep and cover with soil – we can expect to be harvesting these in May or June. We also planted some red onions – Red Baron,sets not seeds (these are small onions which swell. 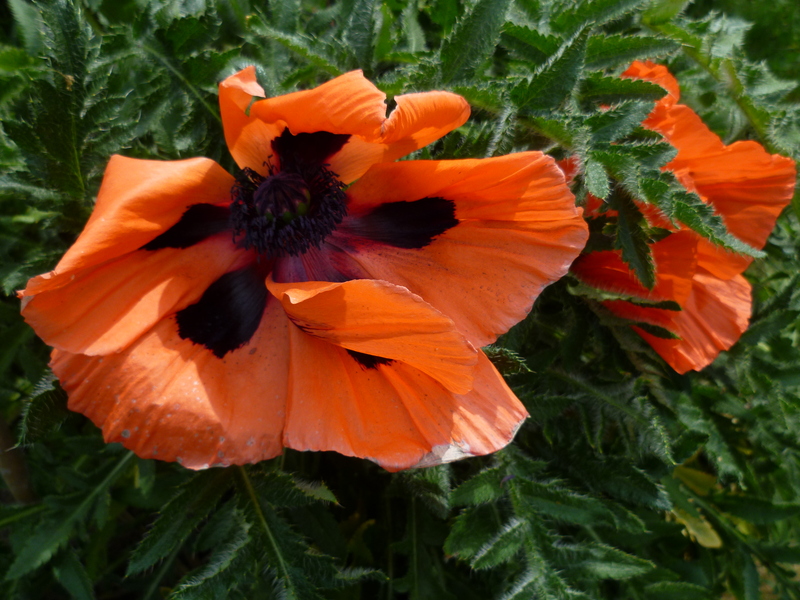 )Plant these in a shallow drill with their tips just showing above the soil. If you like shallots these also divide– a bit like garlic –but above the ground -so you get about 5 shallots from 1 bulb and you need a bit more growing space. 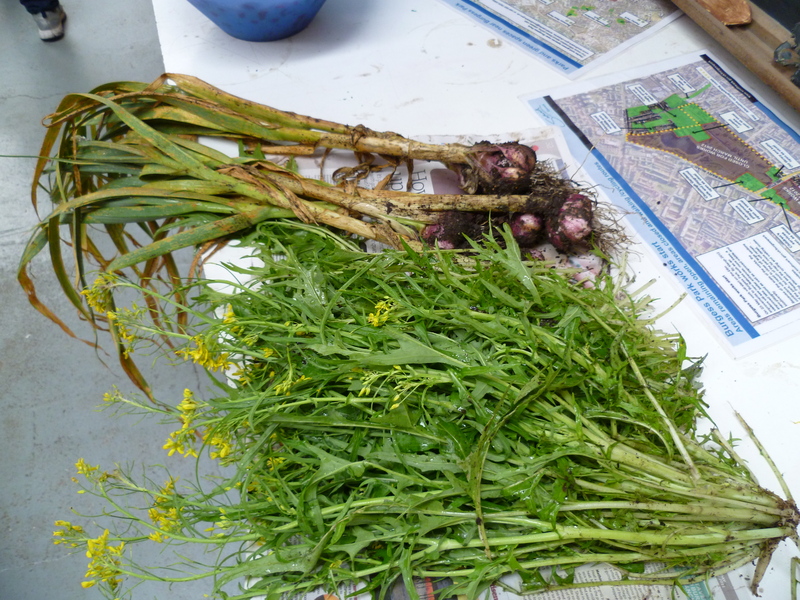 We netted both of these crops at soil level –to protect against cats,mice and birds ! 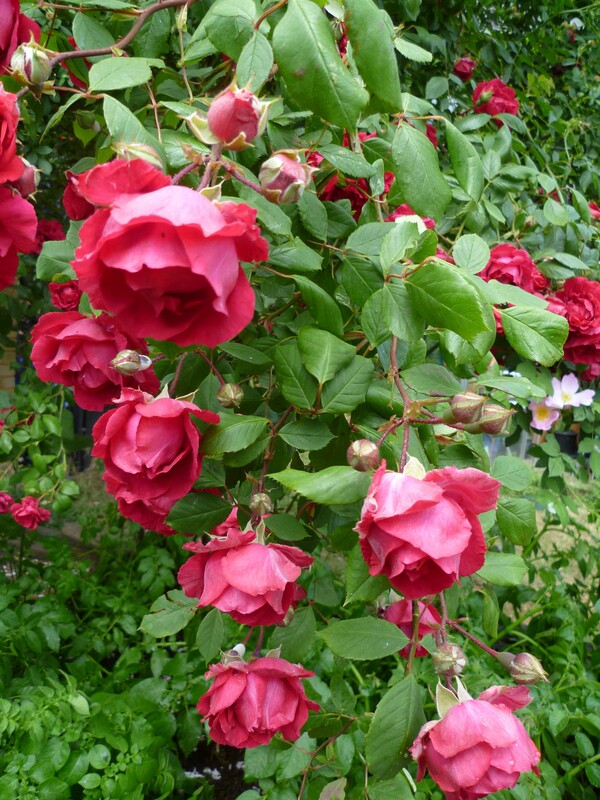 That’s almost the last of our gardening tasks for the year – we still have a bit of pruning to do in the garden – the apple tree,grapevine and roses need a good trim to promote flowers and fruit. Still we will have plenty of winter veg to harvest – leeks,purple sprouting broccoli,curly kale and swiss chard – to keep us interested. In the meantime we can sow broad beans and sweet peas in toilet rolls in the greenhouse ready to get a headstart when we plant them out next spring. 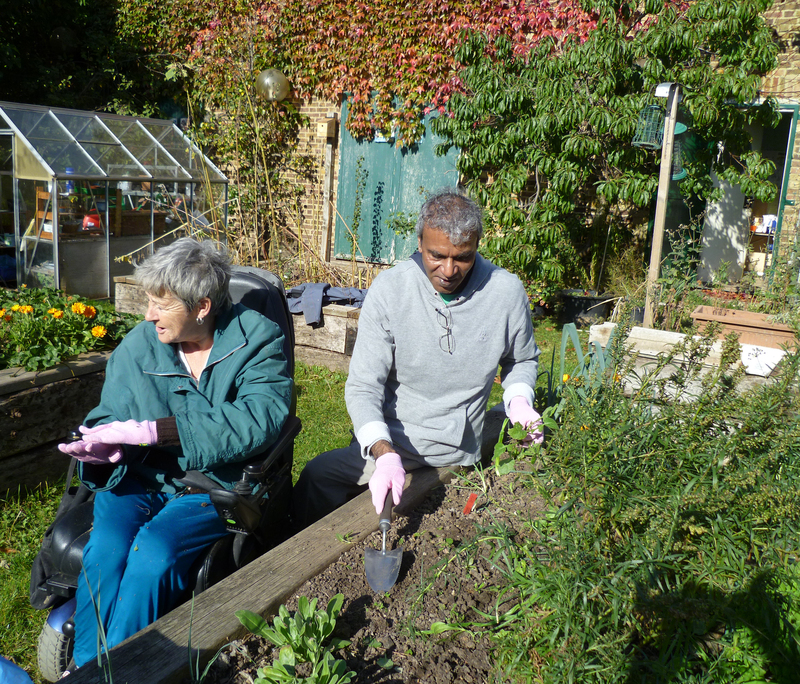 It is a beautiful dry, sunny and cold autumn day – perfect for gardening. Time to catch up with some seasonal tasks! We admired our cayenne chillies and peppers in the greenhouse – keep picking, feeding and watering these so that they ripen before first frost. Love your soil! – it’s where all good gardening starts. With our raised bed system we have to be constantly replenishing the nutrients in the soil as we are more or less intensively farming – so as well as using the bed rotation system (that’s growing different crops in succession – not the same one in same spot year after year) – we have to add lots of organic matter and now is the best time. First of all we picked the last of our lovely pumpkins which have now ripened and should be good for storing (if we don’t eat them straight away!). 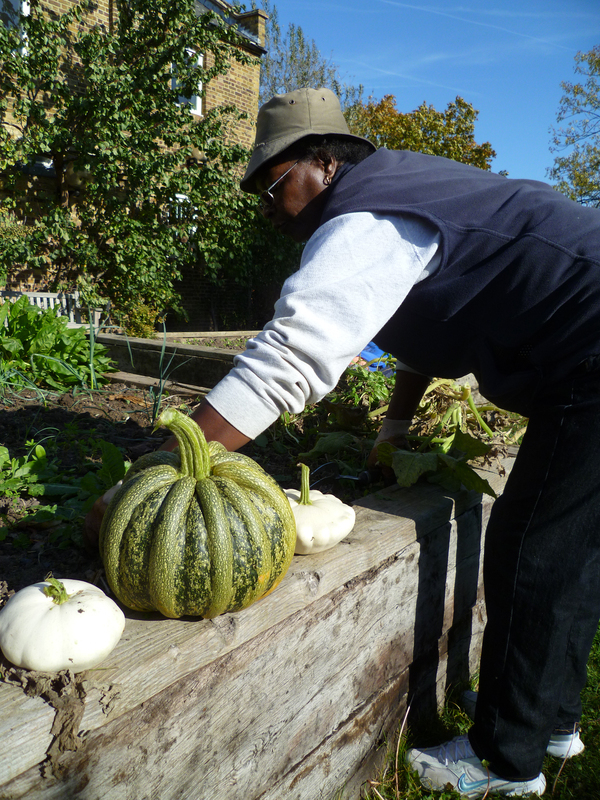 Sometimes we save the seed but pumpkins are ‘promiscuous’ with their cross pollinating and we won’t always get what we expect – still if you’d like a surprise give it a go as seed is very expensive. But if you know it was an F1 variety don’t bother – it will revert back to its wild state and be bitter. 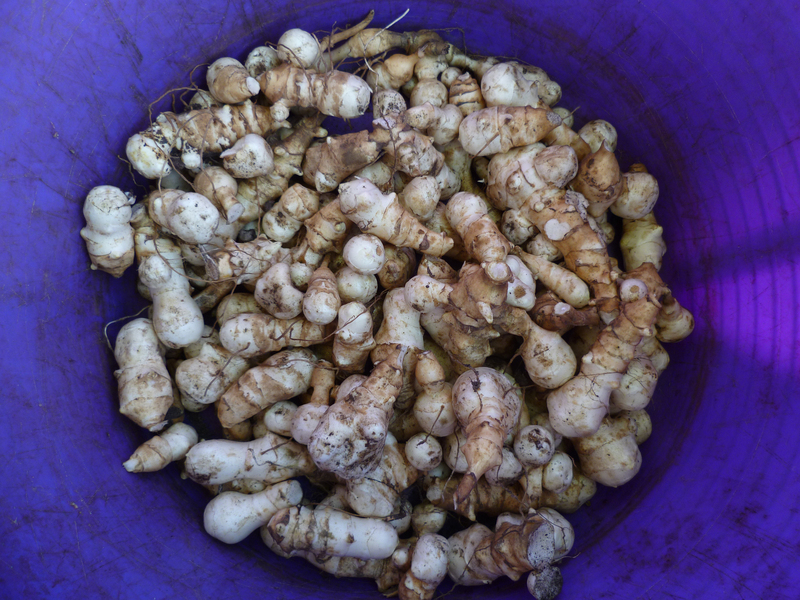 We also harvested a huge crop of Jerusalem Artichokes (otherwise known as ‘fartichokes’ for obvious reasons!). Not to everyones’ taste but good in soups and mash. We covered the empty beds with a good mulch of home-grown compost and some horse manure and then covered them up with some horticulture membrane – this will stop weeds growing and keep the local cats and foxes off. If you’re growing brassicas now is the time to do a ph soil test – add lime if its too acidic and don’t add manure at the same time. Most veg likes slightly acidic soil. 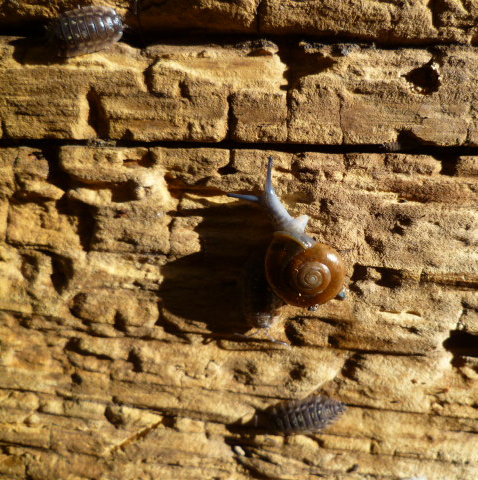 It’s not only the plants that are getting ready for winter – Bryan found all sorts of invertebrates getting ready to hibernate under wooden boards – snails are now laying eggs so expose them for the birds to feed on .We found a leopard print slug (rumoured to be carnivorous and eat the common slugs), large wood-lice and lots of worms – all decomposers and signs of a healthy eco-system. Autumn is the season of death and decay!! But we can look forward to new shoots next spring by planting our garlic, onions and broad beans which we will do next week. 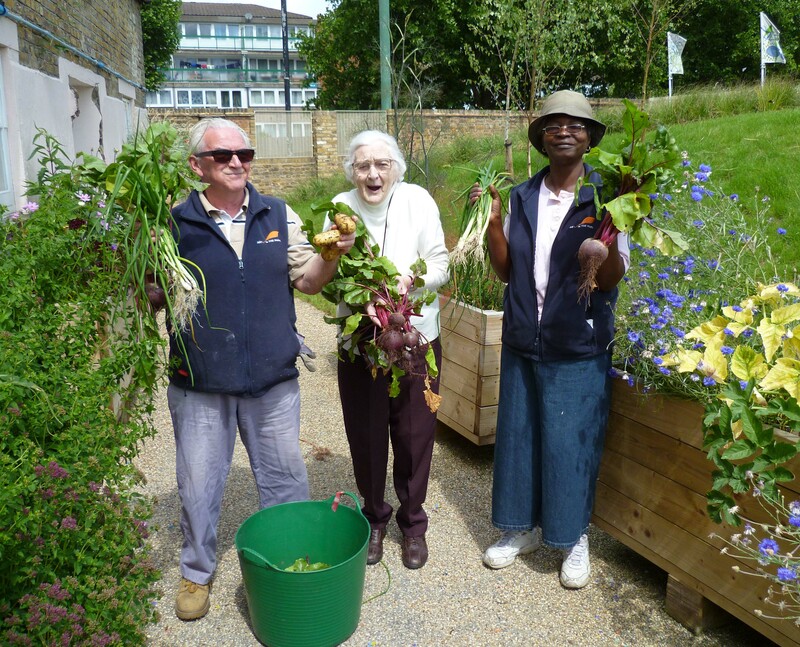 It’s been a very busy summer at the Heart Garden this year! So we have not had the chance to keep you updated as much as we’d like. 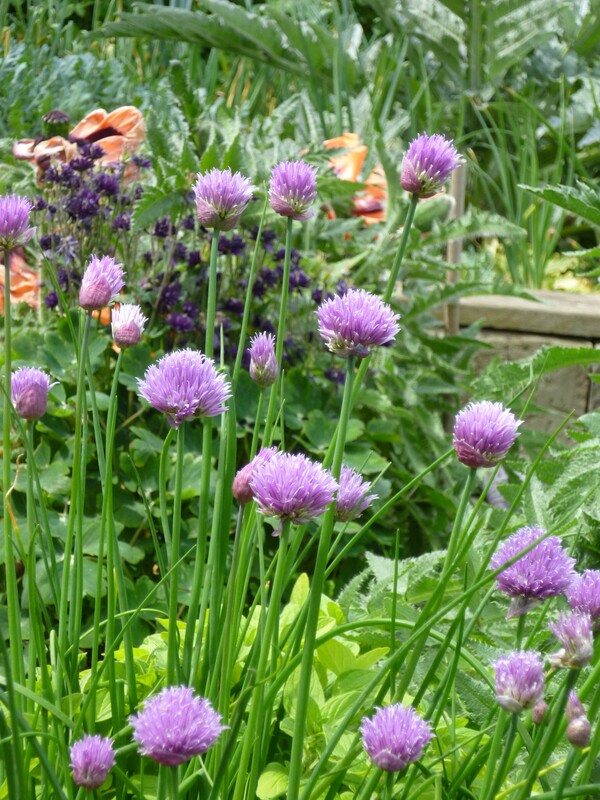 But now have a huge post all about summer in the Heart Garden – our Heart Garden diary, written by Heart Garden gardener Rebecca Scott, full of beautiful photos and tips for aspiring gardeners. The seasons are changing! – We have left the bulbs in our containers for next year and planted up some cheerful pink and white geraniums (pelargoniums) in their place. There seems to be a lot of windy and rainy weather forecast for this summer. If that’s the case bees and other pollinating insects won’t be flying as much and yields could go down. 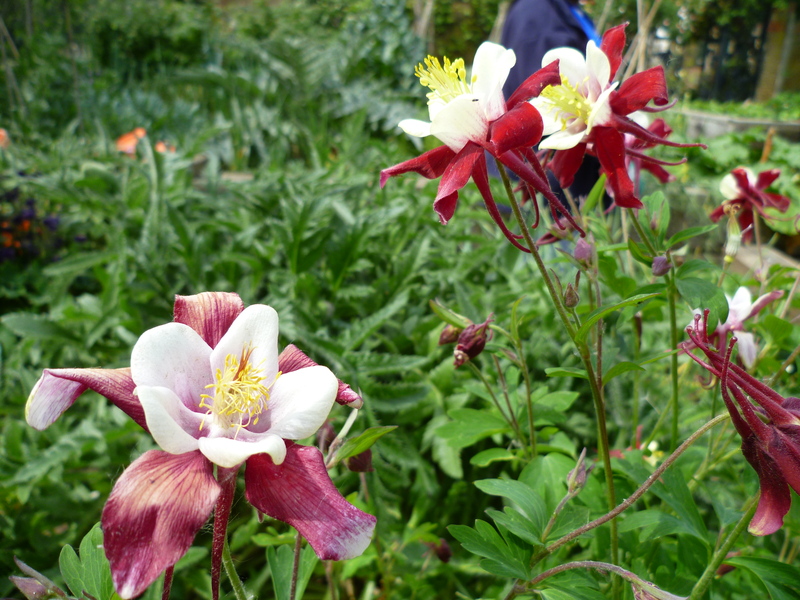 But did you know, you can help the plants along by hand pollinating using a paintbrush! 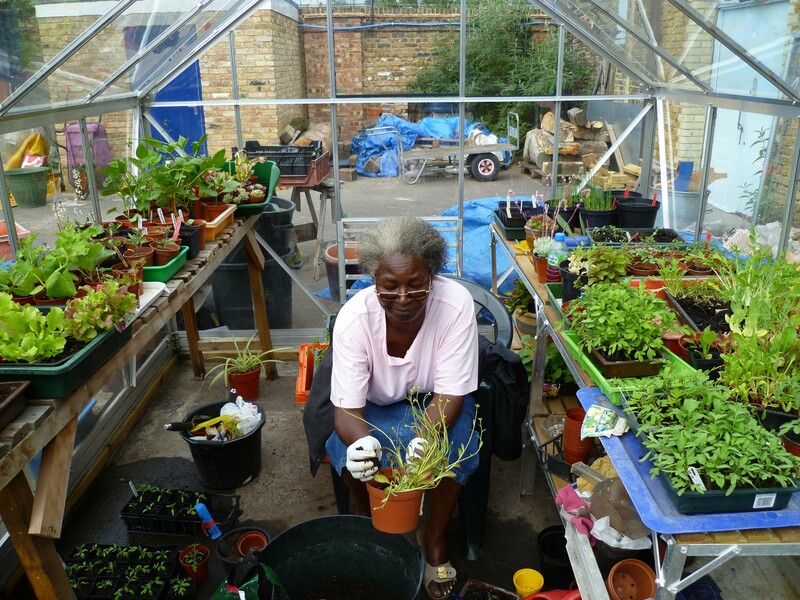 And don’t forget to open up the doors of your greenhouse to let the insects come in and feed on the nectar (and pollinate your tomatoes and chillies at the same time). 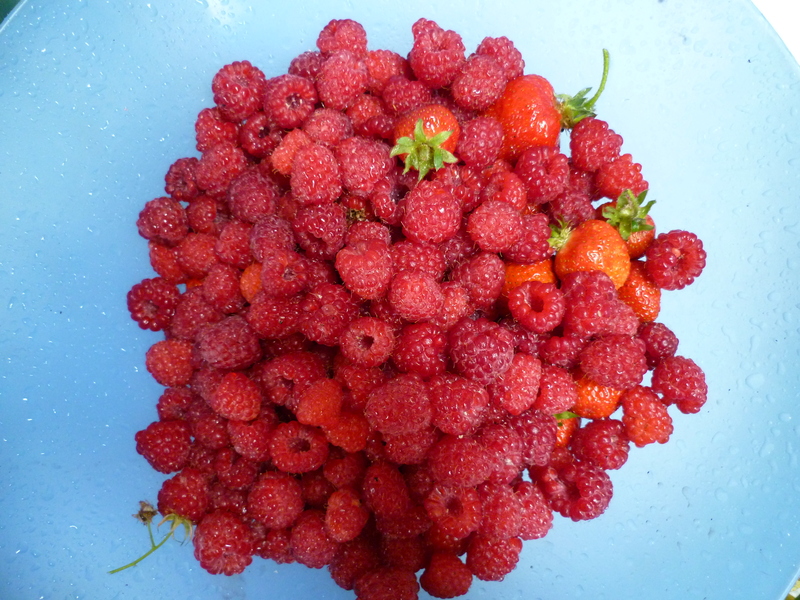 We also had a good crop of summer fruiting raspberries which like a bit of shade. 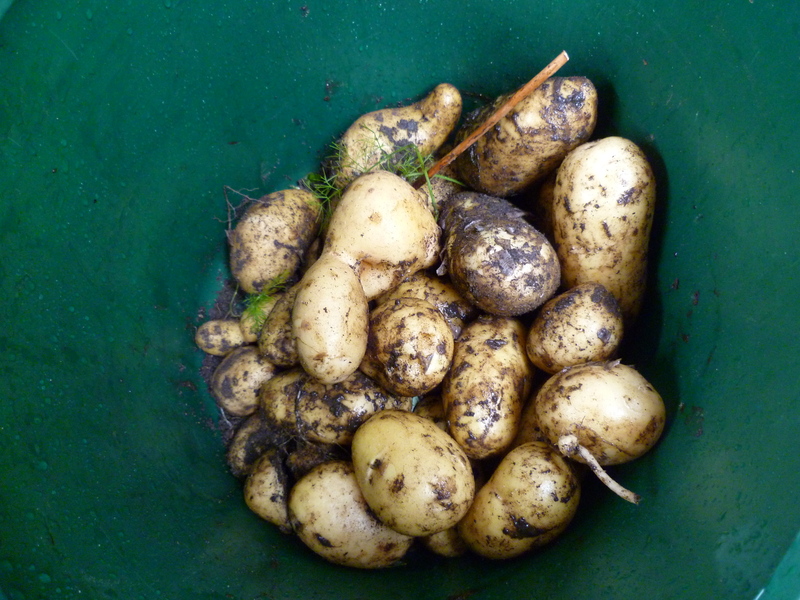 Its harvest time – new potatoes (Ratte, Charlotte and Anya), beetroot, spring onions, salad leaves and indoor and outdoor cucumber! 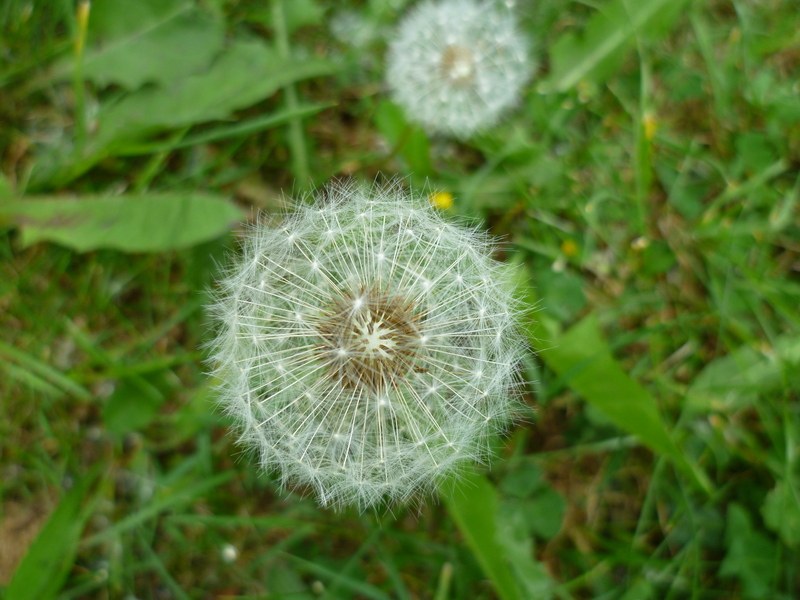 At this time of year weeding is a priority – the weeds will compete with your veggies for water and nutrients in the soil and can harbour pests and diseases – “one year weed, seven years seeds” as the saying goes. 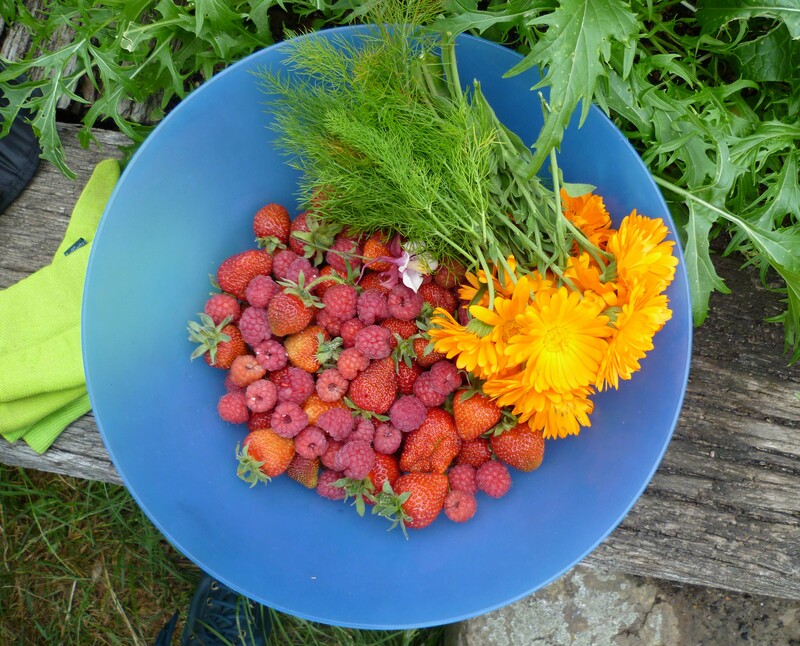 Don’t compost them if they have already produced seeds, make a weed heap – let them bake in the sun first or put them in a bucket with water, cover and use as a liquid feed! 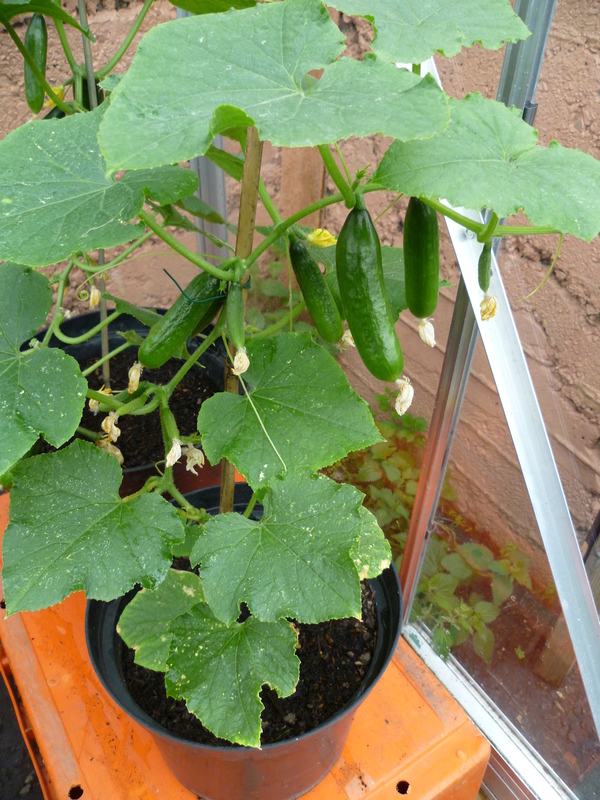 After the first harvest there is space to plant some more veg. Spuds make way for beans and our borlotti and purple queen are attractive and versatile. 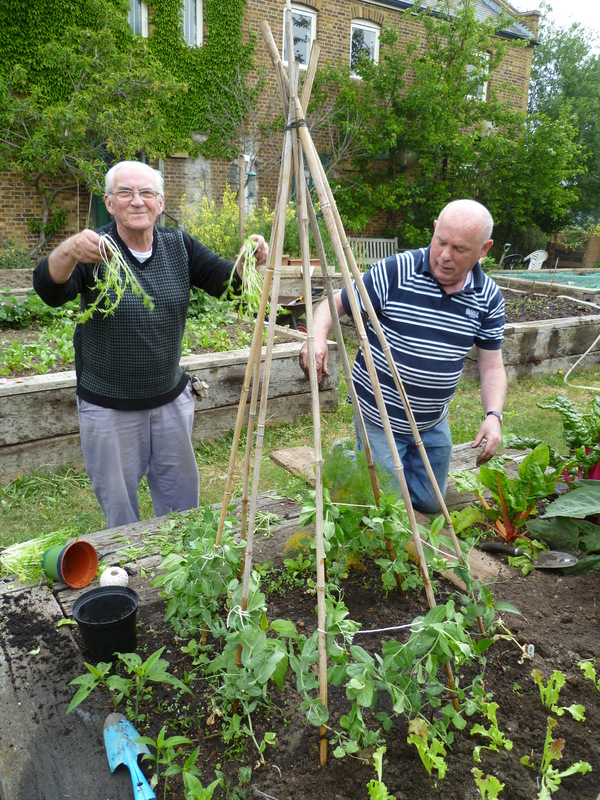 If you’re thinking of growing beans but only have a little space try vertical gardening using a wigwam of canes! 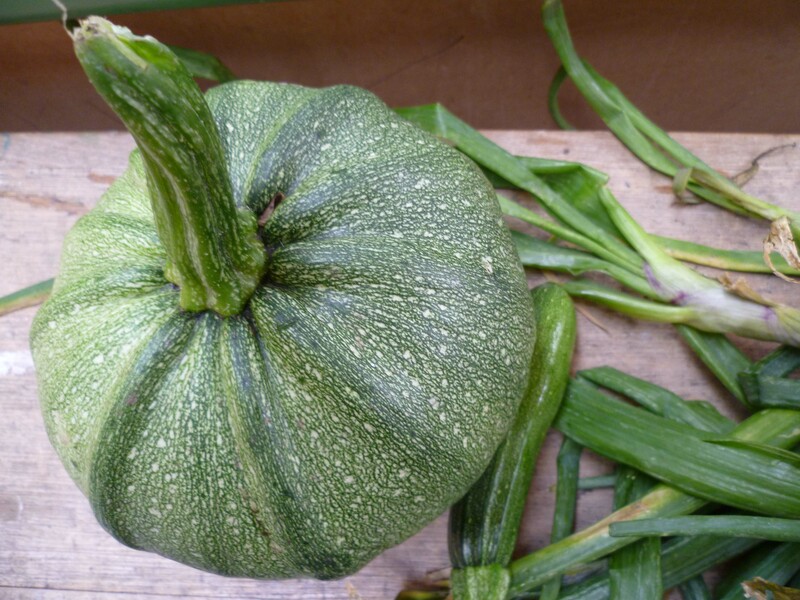 This is a good time for planting summer squash and winter pumpkin – we are growing patty pan squash, courgettes, and a mix of pumpkins including turks turban. We harvested some rhubarb and hot radishes. Did you know you can eat the leaves of radish too or wait until they set seed and stir fry the pods! We dug up the last of the spuds and harvested herbs to hang up and dry. 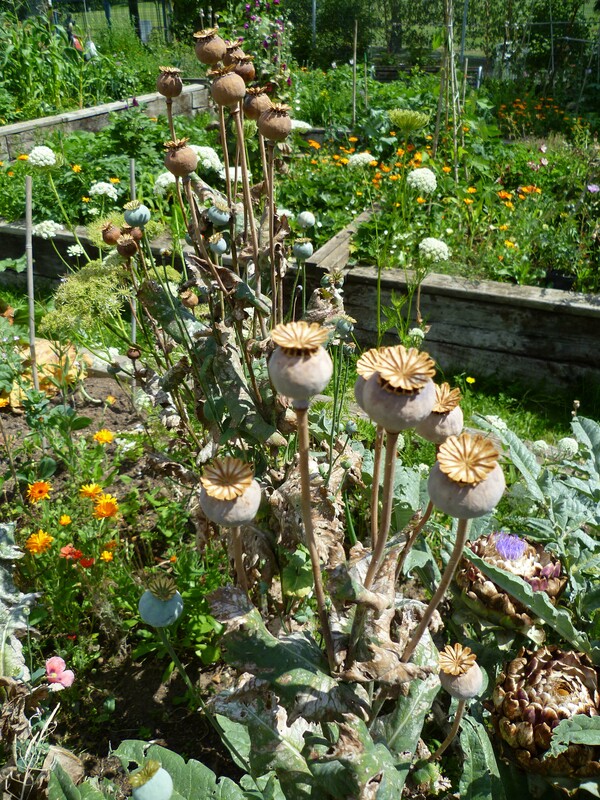 By now they are at there most potent, in fact traditionally they should be harvested on the Summer Solstice, June 21st. We harvested an early crop of apples today! 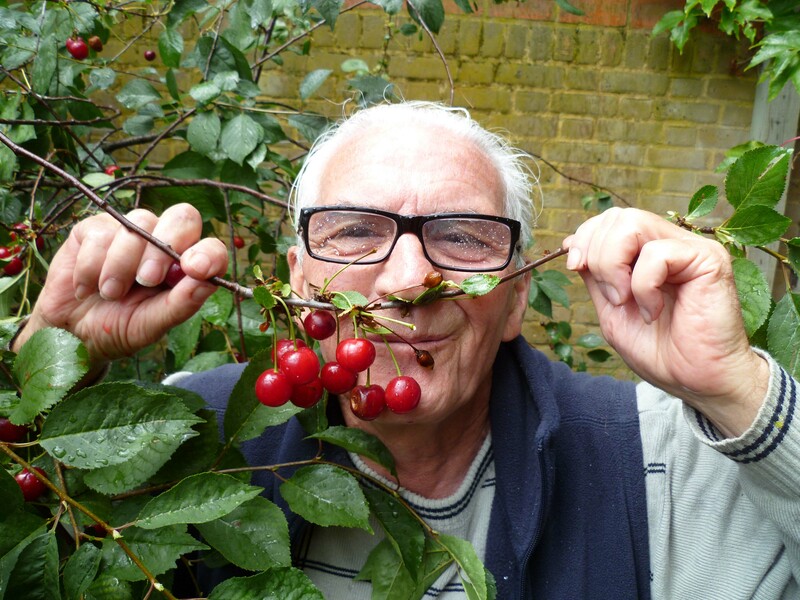 – fruit yields are about a month early this year due to the unseasonably hot Easter! It’s time to plant up winter veg. We’ll be planting some leeks – to plant your own trim the roots and tips and using a dibber make a hole and drop the leek in, water it and allow the soil to naturally fill up the hole. 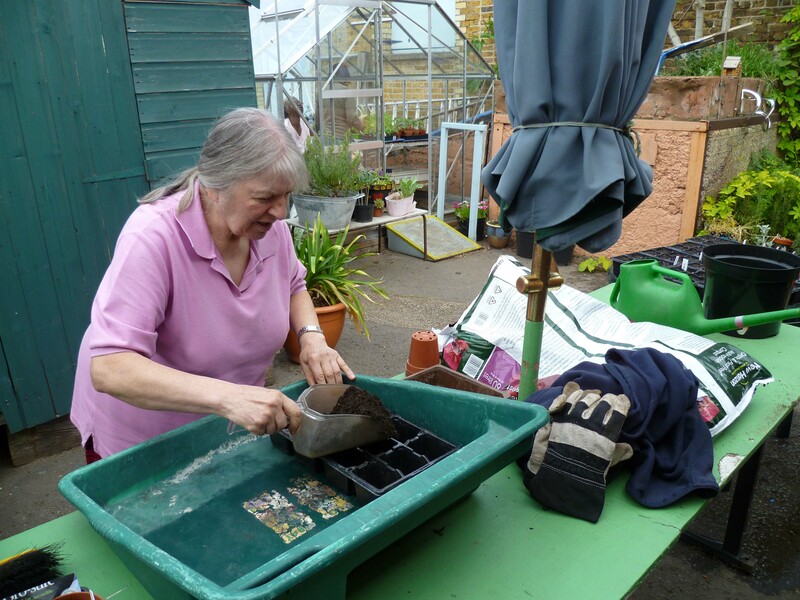 We also potted up our chili and pepper plants into larger containers – these will stay in the greenhouse – they will need to be well watered and fed with a high potash fertiliser (seaweed is good). 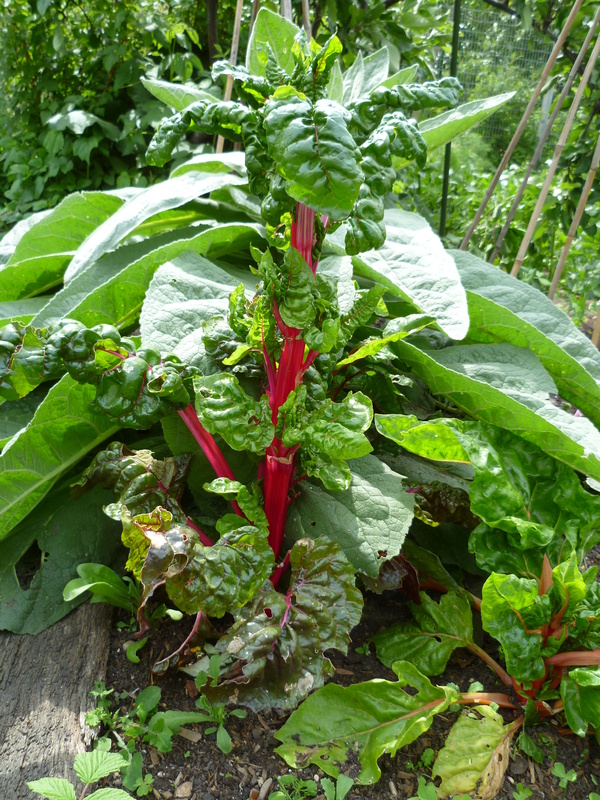 We had a bumper crop to harvest this week – bright lights chard (so colourful! ), apples, courgettes (round, yellow and green), spring onions, more beetroot(!) 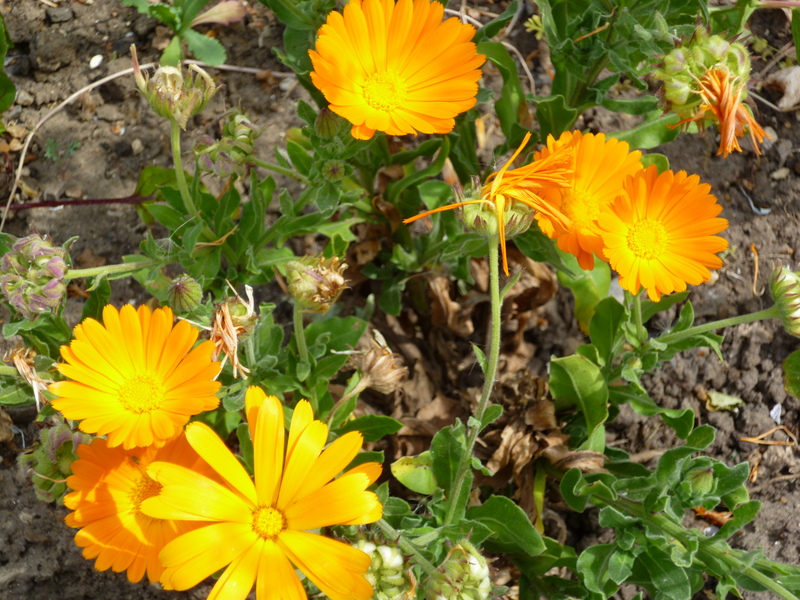 and marigold flowers to eat in salad. We have some other edible flowers in the garden, nasturtiums, which have a really spicy kick – you can eat the petals, the leaves and the seeds can be pickled like capers. It’s been dry and windy so the plants in the veg patch need a lot of water! Some veg get especially thirsty, such as pumpkin, squash and fruit, which is why its so important to prepare the soil with lots of compost to retain the moisture – especially as the Heart gardeners only meet once a week! It’s time now to plant out more winter veg – curly kale (green and blue). It’s also time to make cuttings of pelargoniums to add to the stock for next year. We took a few cuttings to put in water and will watch the roots grow. We’ve also got our first crop of tomatoes from the garden (a little behind the snug greenhouse crop) – the cherry tomatoes have done well but the larger marmande and heritage ‘black’ are slower to ripen. We started cutting off the lower leaves to let the sun get to them and pinched out the tips. Sebastian (my 11 year old son and a keen gardener!) brought in a penstemon plant he had grown from a cutting for Cynthia and she swapped him some collected seeds. 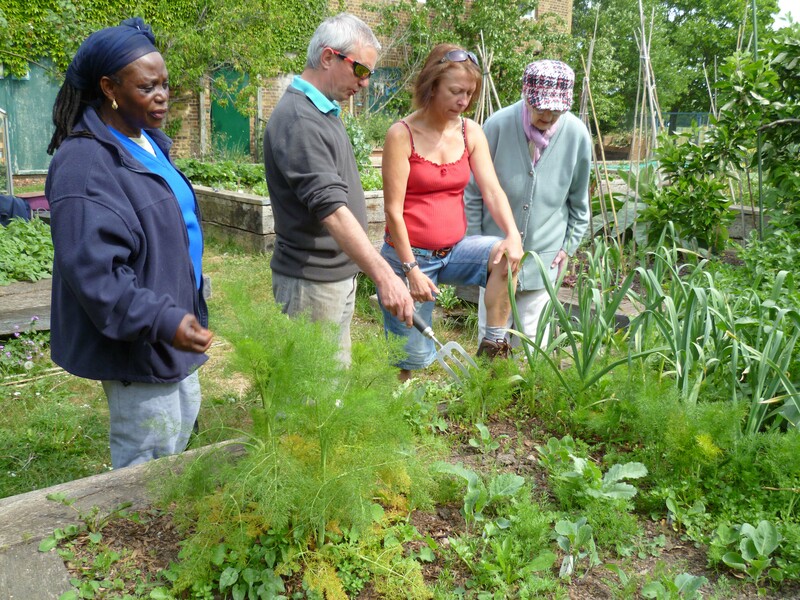 This is great currency as gardening can be expensive but if you club together and exchange you can get a greater variety of plants and veg in your garden – we always sow too many seeds and it’s such a shame to chuck them away. Its propagating time! So we took cuttings from our productive strawberry runners and pegged them down into small pots to make new plants (you can do this in the bed while they are still attached to the parent plant.) A walk in the park can bring all bounty of seeds (such as conkers or acorns) and you can grow your own mini woodland for free – or try bonsai! 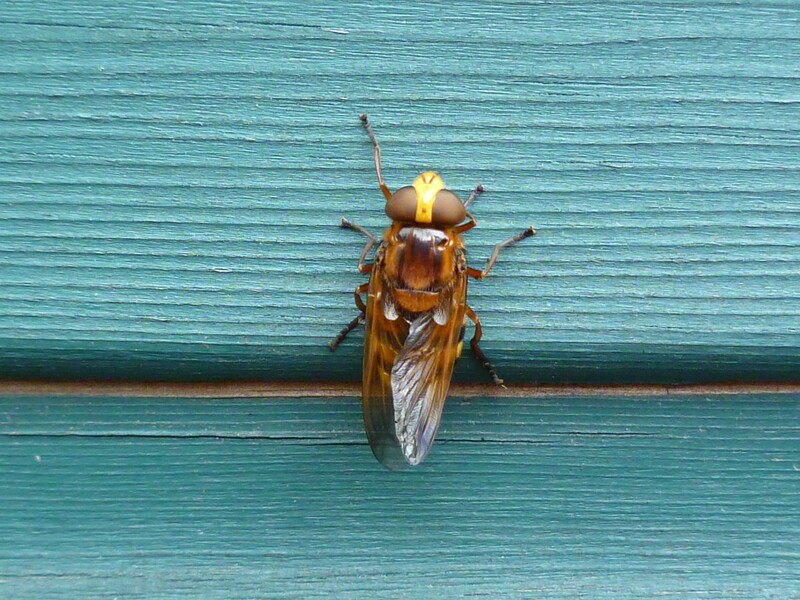 There have been lots of insects in the garden this summer. We had a good look at some of the pests and diseases that are affecting our brassicas – a little green caterpillar that is munching all the leaves, and the tiny white moth that produces clouds! Oh no! You can keep them away with fleece or enviromesh – meanwhile squash them, and the eggs! Despite the lovely hot Indian summer weather it is autumn, the plants know it and the veg patch is getting ready for a rest. 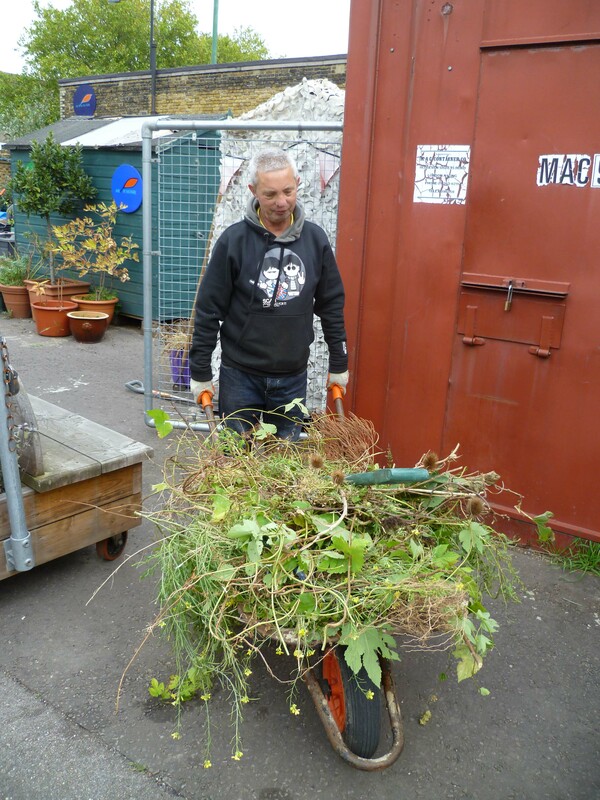 Whilst the pumpkins are ripening in the sun we cleared the beds ready to mulch and cut down the physalis (Chinese lanterns) to decorate the studio. We also cut down our lovely golden hop which has climbed all the way up the fig tree and hung it indoors to dry so we can make soothing hop pillows (not beer!). 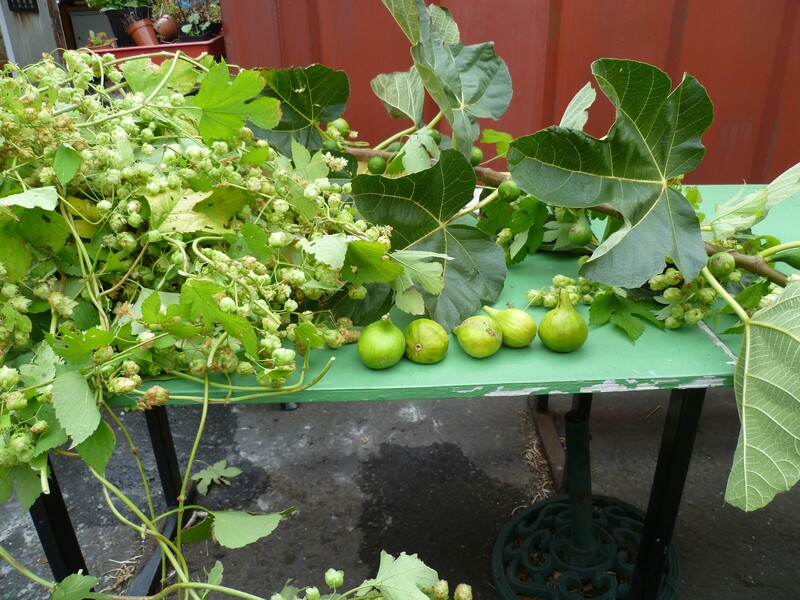 The figs from our brown turkey tree are ripening and we picked a few to try. 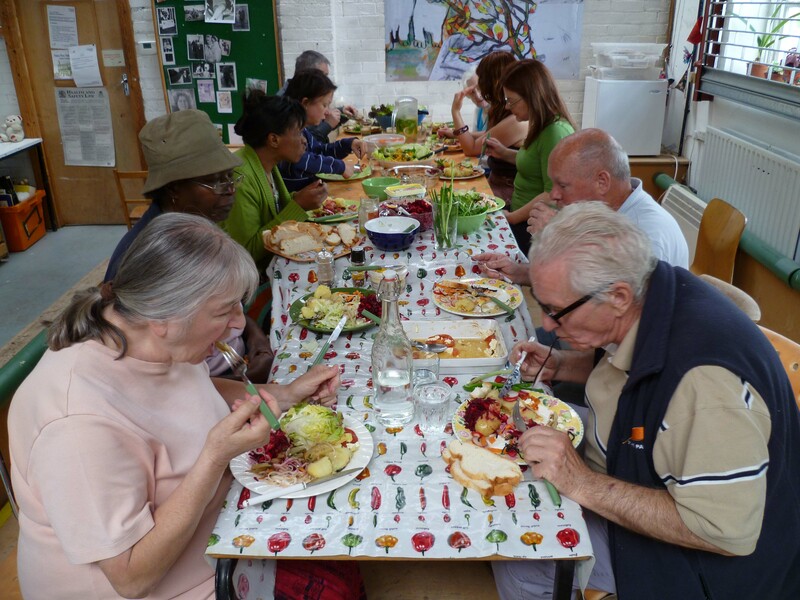 We also made some living salads for the windowsills at home – if you would like to do the same, choose a mixed leaf variety and sow it into shallow trays (we used recycled food trays.) Keep it well watered, in good light and in a few weeks time you can pick fresh salad leaves for the price of a packet of seeds! We keep dead-heading the geraniums and pansies in the planters out the front of the studio to extend the season. The flowers are still showy and will last until first frost, then our daffodils and tulips will spring up from last year. 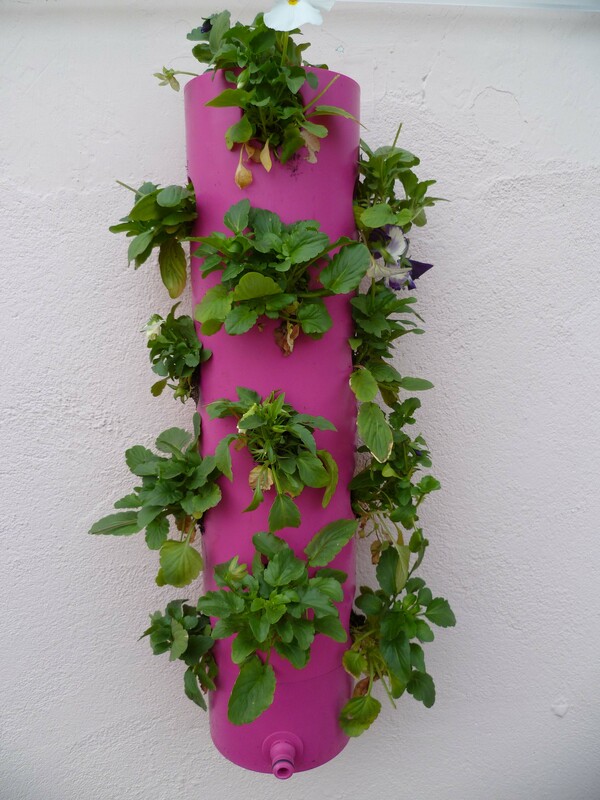 We planted up our polanter – our experiment in vertical gardening- and attached it into the wall by the studio entrance. The weather is sunny but chilly as it should be for autumn but we can still admire our hard work sowing seeds that is paying off now with our lovely display of blue morning glory (ipomea) snaking up the wigwam by the sheds. 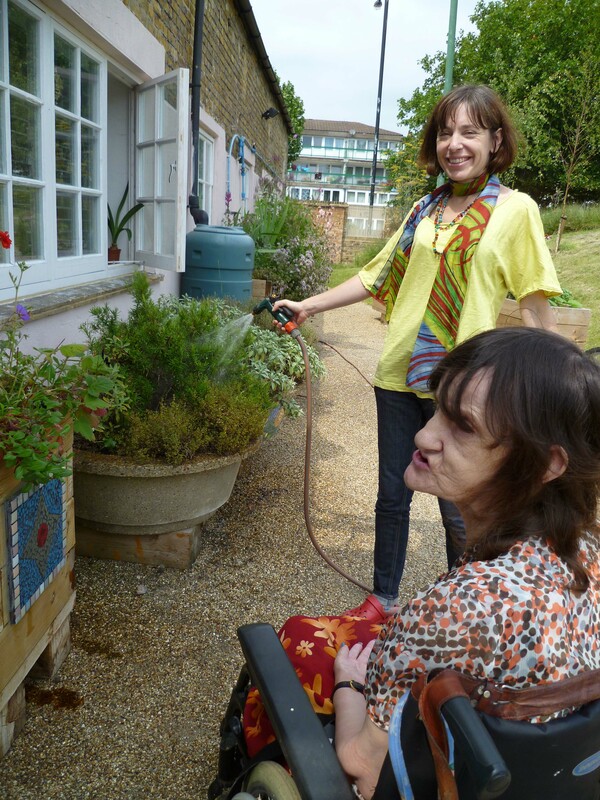 I hope you enjoyed our Heart Garden Summer diary! The garden is in its glory and full of fresh produce. 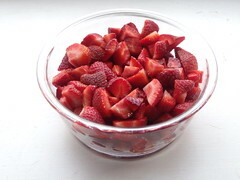 This year we have a really early crop of strawberries and raspberries and had a fantastic Eton Mess at our last Heart Garden lunch. Some of the Heart Gardeners want to know how make the meringue so we will be running a demo in the near future. We put up loads of netting to protect all the soft fruit from the birds. 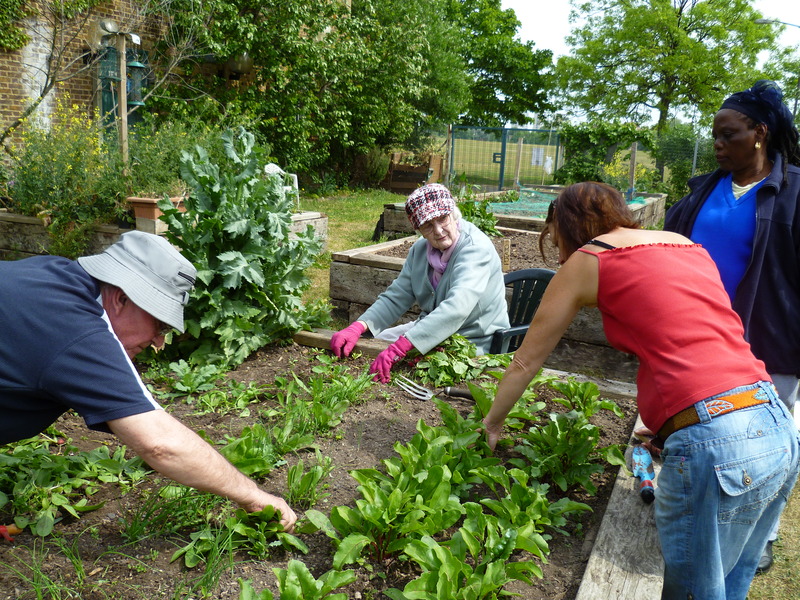 The weeds are growing fast too so we have been doing loads of weeding and loads of watering in the morning and early evening. The foxes continue to cause havoc in the vegetable beds just outside the studio and we find the most wierd selection of large bones in the yard? Where do they find them? After preparing the beds with fertilizer manure and blood, fish and bone (NPK – Nitrogen Phosphorus and Potassium) last week, we were ready for seed sowing this week. 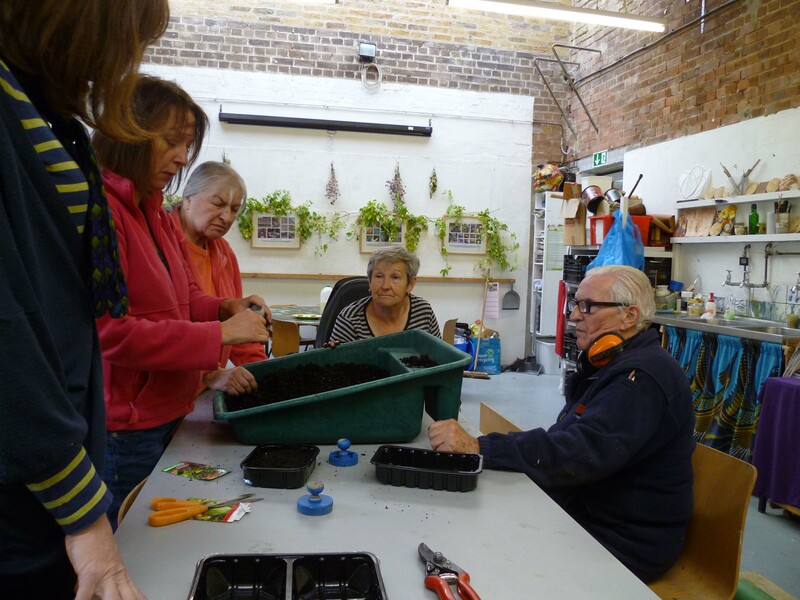 We prepared a fine tilth (soil with good structure and nutrients) and sowed our seed into drills – radish, spring onion, dill and parsley. In another raised bed (previously the sand pit – perfect for carrots) we sowed two rows. As we have had lots of windy weather all our lovely spring bulbs in the front of the studio – the crocus and daffodils provided excellent nectar source for all the flying bees!